Palestine's Ministry of Local Government (MOLG) oversees municipalities and village councils in the West Bank and the Gaza Strip. It needed a way to effectively manage urban development in these two unconnected pieces of land. A team developed an enterprise GIS that disseminates real-time spatial information from one central location, reducing the time, cost, and manpower needed to collect and analyze this data. One of the ministry's key responsibilities is approving urban master plans in all of Palestine's cities, towns, and villages. 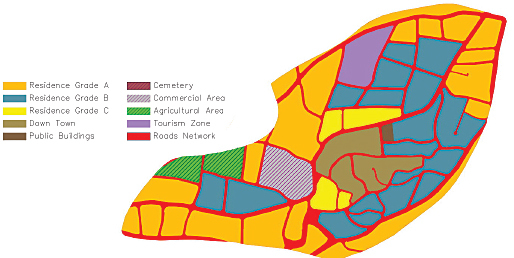 Urban master plans assign land usage rights (whether a property will be residential, commercial, or agricultural, for example) and classify road networks (their placement, width, and slope) to inform planning and construction regulations. Given that the West Bank and the Gaza Strip are relatively small in size at around 3,700 square miles (6,000 square kilometers) with a small population of about 4 million people, MOLG wanted to be able to house all urban planning information in one database and have its Spatial Information Systems Department edit and manage data in real time at the local, regional, and national levels. MOLG also wanted to provide a user-friendly public portal whereby other government officials and the general public could easily access planning information for any location in the West Bank and the Gaza Strip. While the end product is a straightforward web mapping application, the data manipulation efforts required to support the team's ongoing operations are both extensive and critical. To keep within budget constraints, substantial efforts were made to reduce development and define areas of efficiency. The team used CAD software to draw out land usage and road network features and implemented Safe Software's FME Desktop to convert hatches to polygon feature classes. All the urban master plans are stored in a single enterprise geodatabase on Microsoft's SQL Server to enable multiuser editing. The feature classes in the geodatabase are added to a map document in ArcGIS for Desktop and published using ArcGIS for Server, which makes sharing easy. End users then interact with and manipulate the spatial data using web viewers powered by Latitude Geographics' Geocortex. Additionally, field teams use ArcPad to continuously collect data—mostly on public utilities and facility locations—which can be uploaded straight to ArcGIS for Server and reflected on GeoMOLG in real time. Based on the success of the initial web mapping application, the ministry made additional data available on GeoMOLG beyond urban master plans, including land parcel specifications, agricultural classifications, local authorities' administrative boundaries, electoral districts, and even aerial photographs. With such a large amount of geographic information available in one place, GeoMOLG soon began fostering cross-disciplinary communication and collaboration on an unprecedented scale within the government and with nongovernmental organizations and academic institutions. It quickly became the most important source of spatial data in Palestine. In fact, at the application's official launch in November 2014, Palestinian Prime Minister Rami Hamdallah stressed the importance of further developing GeoMOLG by incorporating additional data and adding capabilities to expand its reach.